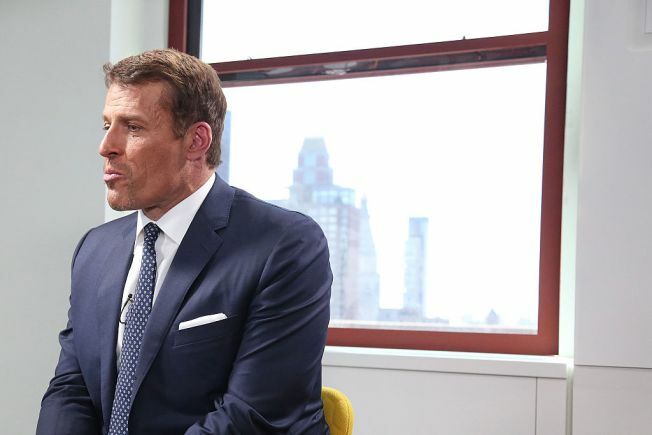 NEW YORK, NY - OCTOBER 05: Tony Robbins is interviewed as part of the "LinkedIn Presents" series at The Empire State Building on October 5, 2015 in New York City. Self-improvement guru and motivational speaker Tony Robbins -- who by now is no stranger to Bay Area-based philanthropy -- is coming to the aid of an 85-year-old Burlingame woman whose roommate and friend died last month. Robbins, who has amassed millions of dollars through books and speeches, stepped up and offered to pay a hefty portion of 85-year-old Georgia Rothrock's rent at a senior citizen's complex. According to attorney Paula Canny, who has been helping Rothrock in a housing dispute, Robbins offered to pay $450 a month for the rest of the octogenarian's life. "Tony Robbins is awesome," Canny said, adding that Rothrock will be moving into a senior housing complex in Belmont this coming week. She will use the $450 and her Social Security Check to pay the monthly cost of living at the complex. Rothrock had been struggling to find a new home following the death of her 97-year-old roommate, Marie Hatch. The pair were in the midst of fighting an eviction notice from landlord David Kantz, who inherited the property from his late wife and is reportedly following the dictates of a family trust. This is not the first time Robbins has come to the aid of Bay Area residents in trouble. in February, he bailed out a soup kitchen run by a pair of nuns. Then, he put up $650,000 to find them new housing, according to the Mercury News.